Parenting is often a journey of decisions and choices. The only one choice that we left in God's hands, is the gender of our birth. I'm in the journey of parenting 1 daughter and 2 sons. In any way, I'm blessed. But that has also made me realized the significant fears and worries of raising a daughter. Jazz's arrival 7 years ago moulded and mellowed me in various ways. A once quick to speak and act lady, now turned a cautious woman. For I know, my words and acts will be mirrored by little followers, especially daughters who look up to their Mothers as role models. So when someone cuts my line in a queue or when a driver drives recklessly into my lane, I've to exercise good thoughts and handle circumstances calmly. Motherhood is changing! Parenting Jazz is a bliss, she is one thoughtful and kind-nature girl who rarely gives me heartache on academics and the various ways that make it easier. She is very teachable. She is sweet and lovely in the different ways from Jare. It wasn't too long ago that I carried her in my arms, witnessed her walk and now, starting out in school. Not too long later, she will have become an adolescence. And even sooner, she will leave with her prince. During the transition of phases, I foresee many worries and challenges ahead of our relationship. I've come to discover more about our Mother and daughter relationship. It doesn't get easier. We grow on our differences, perceptions and ideas. The gap widens, and it's even more evident when I see this between my Mum and I, even till today. Girls deal more with emotions than boys. So frankly, I ain't too worried about how the boys handle their obstacles and failures. Which brings me to the point about how Jazz handles her emotions. We often find opportunities to praise and reward, to build on that self esteem. If something's well done, we are quick to give credit and when something goes wrong, chiding her swims up a bag of emotions. We had a battle yesterday morning, and it spurred my thoughts about raising daughters. Not invading too much into her privacy, I've to say there really is much work to do in me, when handling the daughter. Things will not be the same, and parenting style will have to adapt to her different stages of maturity. My points and concerns will not always make it to her mind. Steel hard truth. In midst of these, always comes the emotional challenge which I am either hot headed with or frightful of. Hot headed when I see that it's not a necessary fuss, or frightened because I don't know how will she want to deal with it. Emotions isn't just within our bubble, it affects the people around us. It's not easy to deal with negativities positively. Jare on the other hand is usually quick to get over a bad feel. I wish I could always be saying these kids forgive and forget easily. Dealing with a girl is almost like navigating a land mine or decoding a password. It's tough and complicated. Aren't all women in that same boat, anyway? In the coming years, I should know that we will have more differences, we will have fights, she may hate me, she will hoard onto the things I deem as trash and she will think that I don't understand her. But all in the name of Love. I love her and I have never wanted to compromise on what's best for her and her character. Do you feel the same parenting a girl too? However smooth or rough our journey, she will always be my daughter, my friend and my best shopping buddy! It's always nice to come across books written by local writers. Not the literature aspect, but children's storybooks. Mostly inspired after a turn into parenting. Here's one book we came across recently, Meet the Wakersaur authored by Shervin Seah and illustrated by Candice Phang, is about a made-up creature that's specially equipped to wake sleepheaded children up in the morning. When I first heard it, I knew it was one perfect book for Js who often finds getting out of bed an early morning chore. Can't blame them, they take much after their parents who love to sleep. This book was inspired by Shervin's experiences in trying to wake his kid up on a school day, where he had to tickle him, rub his stubble on him and smoulder him with kisses. Much of these familiar scenes went into the creature, Wakesaur. Yes, the Mummies don't get it. Which is why Mummies need to get hold of the book, and summon the Dad in for bedtime story. So each time I'm busily occupied and the kids ask for a story, I'll tell them, "Get Daddy to do the Wakesaur." I love it when Mums don't get it at times. This book suitable for children between ages 2 to 6 requires the use of our animated voice. You gotta try be as funny and as entertaining as you can. It can be highly interactive between you and your child. Tickle, make faces and rub your stubble on your kid. See why it's Daddies exclusive. 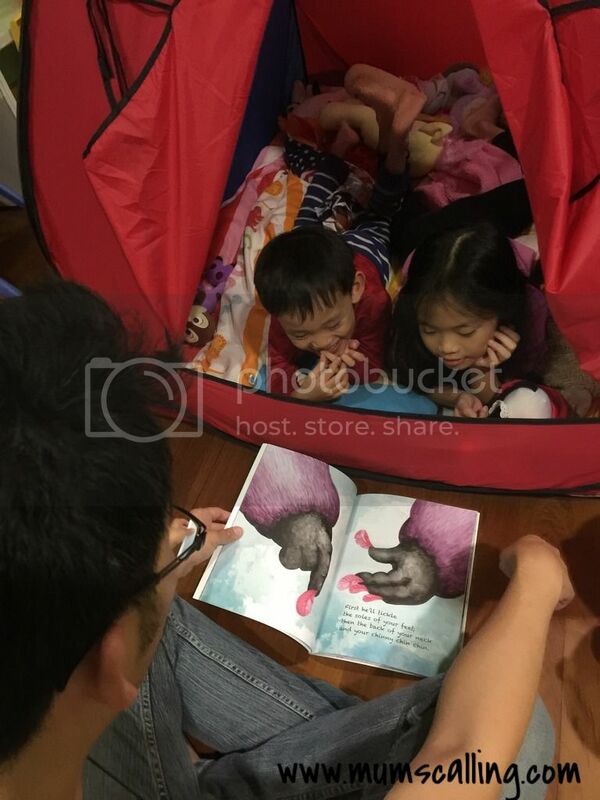 Looks like the kids are enjoying this book with their Daddy. 1. What are some of the challenges you faced as a local book writer? One constant challenge is time: finding the time to write, to source for illustrators, to oversee production, source for printing quotes, press check etc. while balancing a day job. The other challenge is finding a publisher and distributor, which I guess is something that's not unique to local writers but writers everywhere. But I think in SG, this problem is exacerbated by our small market, which results in fewer options of publishers, distributors and specialty bookstores. For example, a publisher who wanted to explore working with me was based in KL. 2. What message would you relay to young aspiring writers? With the Internet, it's easier to self-publish, promote and sell. Research and explore the web. For example, Amazon has a self-publishing platform called Createspace and with bloggers like yourself who's willing to support local writers, there are some marketing/promotion options available. Be resourceful. 3. Any idea what's ahead, after Wakersaur? I have another book being produced right now. It's called Twinkle Twinkle Great Big Star and it's about stars and planets. I wrote this because when my child was younger, I wanted to introduce outer space to him but couldn't find something age-appropriate (he was around 4 yrs old then). Everything out there was text-heavy and read more like a textbook. So I decided to create one myself, one that presents this scientific topic in a way that children aged 3 to 6 years old can grasp. It's being illustrated right now and should be available later part of the year. Aspiration and passion turned into actions. Just how determined one has to be to see through all challenges to see fruit. I love how this book was birthed and can't wait to catch Twinkle Twinkle Great Big Star! Meanwhile, Meet the Wakersaur is widely available in Popular and MPH bookstores. Get your copy soon! What more can I say about a book written this creatively for both Dad and child? Further more, let's support local. 2. Tagged 3 friends on this Facebook post, whom you think will be keen in this giveaway. Feel free to share this post so that more people can know about this lovely book. Giveaway ends on 07 July, 2359 hrs. All the best! Disclaimer: A copy of Meet The Wakersaur was given for the purpose of this review. No monteary compensation was involved. All opinions and photos are solely ours. It's been quite frequent now that we bring Juboy out with us. When most places aren't exactly stroller friendly, we like to work with our baby carrier. The last time I used one was 5 years ago with an old generation baby bjorn. Fast forward to 5 years later, the man started to kangaroo his baby for the first time. Yes, I've been doing the work of kangaroo-ing for our previous two kids. It must be the new carrier we are using that inspired him. Baby carriers in the market have evolved much from simple to fanciful and functional designs. You name it, you find it. We came across the Lillebaby carrier, complete airflow and are very much contented with the usage of it. The shoulder straps are wide, well-padded and of sturdy fabric to distribute the baby's weight evenly. There's also Lumbar support with a wide and sturdy waist belt to give good posture. These in combination help alleviate pressure on our back and shoulders saving them from strain. I testify to this strongly as it really kept us ache free after hours of usage. Great cushion, sturdy fabric and ergonomic design made it all easy and comfortable for the wearer. The baby too, it's been more than a couple of times that he fell asleep in it. I will describe it as using a marshmallow carrier. Soft and comfy. It's an all summer season here. Being cool, breathable and 3D mesh, it gives both the baby and wearer fresh doses of air. It doesn't feel uncomfortably warm when using it for long. It's so versatile that you can wear it in 6 positions, fetal, infant, toddler, hip and back. For now, we are only exploring the fetal face in position. We know how frequent baby products need to be washed and cleaned. And for being machine washable, this saves us from the hassle of hand washing. There is no one size fit all carrier. Since we rotate the use of carrier between the man and myself, we are happy that the carrier is easily adjustable. Though tightening all straps to the tightest did pose a little of challenge for my petite frame, it got better as baby grew bigger. I did have a little trouble initially to self buckle at the back. But practice made it all perfect, I'm better at it now whenever I'm alone. Of course, it did make it a little more convenient when someone is around to take care of that buckle for me. The complete airflow is suitable from newborn of 3.2kg and above. It doesn't require an insert when using for newborn. I started using when Juboy was about 3.5kg. However, I felt it was more tugged and snugged when I inserted a receiving blanket at the bottom of his seat. Now that he is bigger, I didn't have to prop him up anymore. The carrier is good for newborn of 3.2kg up to toddler of 20kg. That's some good mileage to the use of it. A worthy investment for sure. It comes with sleeping hood that gives baby the privacy while sleeping. It's also a good shield from the sun, drizzle or even during breastfeeding. We use it occasionally while eating, to prevent food scraps from getting on the baby's head. The hood is removable. There's a zipped pocket on the front of the carrier, which is good for a small wallet. It is very much handy for us to store and retrieve some cash and essentials when we need them instantly. The hood pocket that's not zipped allows some storage too. It's lightweight and easily foldable. Definitely a great travel companion. We love how neatly the excess straps can be folded and kept within an elastic loop, without leaving to dangle. The buckles on the shoulder straps can also be tucked within, so it doesn't irritate the baby's face. At a later stage, when baby is taller and falls asleep in the carrier, you can flip up the neck support flap. It supports baby's head so it won't flop backwards. The adjustable width gently cradles baby's head and elastic straps provide support while allowing head movement. If not in use, you can fold the flap down neatly and snap. We love the little customization here to get wearing more comfortable. Its seat width is adjustable to promote developmentand proper ergonomic leg position in every carrying position to support baby’s hip, pelvis, and spinal development. That is, you adjust the seat to a wide setting for the fetal, toddler, hip and back carrying positions. Narrow setting for the infant face in and forward facing positions. The products contain NO lead, toxic dyes, phthalates, or flame retardants. The majority of fabric used is manufactured internally so it meets rigorous standards. Fabrics not manufactured within are submitted to independent and rigorous safety testing before they are used. The padding on the shoulder pads is a non-toxic PE, a material frequently used in baby mattresses. The waist belt is also made of non-toxic PEVA material. Many baby products are now manufactured using PEVA as it is considered “greener” and safer than PVC and other materials. So yeap, I do feel this is the complete, well thought and all in one carrier. However, it doesn't seem as mass market as other brands, especially in Asia. I attribute this to the slight flaw of it not designing for short and petite Mummies like me. It felt kinda inappropriate when I first used, as it wasn't well snugged and tugged. It however got better as Juboy grew bigger to the usage. The man did not have this problem though. Other than that, it really is near being perfect. Their prices are affordable and reasonably pegged to the many features and functionality it has. If you think that the designs are boring, then you do need to check out their tokidoki range. They're lovely! Lillebaby carrier can be purchased at major department stores, baby/kids stores and online baby shops. Disclaimer: A complete airflow carrier was given for the purpose of this review. All photos and opinions are solely ours. Mega SuperMom Online Preorder is happening next Mon, 27th June for just 3 days! While popular items are usually sold out on first day with limited stock available, preordering seems like a wiser way to shop these days. For now, do sign up as VIP to gain access to the preorder and shop on 27 June. While those who didn't sign up as VIP shops on 28 and 29 June. VIP sign ups for first 1000 only. Here's a sneak peak of deals you can look at, with over 300 baby and Mummy essentials and some brands up to 90% off. Free gifts for different tier of spending. No limit on most of the free gifts. You spend you confirm get your gifts. Father's day often gets a lesser light compared to Mother's Day. The winning debate must be that pregnancy, birth and breastfeeding are the tough and irreplaceable journeys uniquely to Mums. Daddies are like unsung heroes who are often forgotten or unappreciated. I couldn't have appreciated my children's Daddy more with the arrival of Juboy. I need to mention, I am really thankful for the extension of paternity leave to 2 weeks, and that his company is pioneering it on this implementation. We were in time! During the 2 weeks, which he had spread over a month of half days were a huge blessing to our family. He stood in the roles of my Mummy taxi duties to and fro school, as well as enrichment classes. He upped his duties in the various departments, especially academics and entertainment. He ran errands in and out, to shops, to clinics and even to markets. Groceries was never his forte. But phew, he didn't need to cook. Even though we had a confinement lady, his expanded duties seemed endless with the constant chores in the family. So yes, I am thankful for the 2 weeks paternity given, without penalizing his personal leaves. During that period, it seemed like the man slept lesser than anyone of us. Some days, he had excess work to complete after the usual routines. It was a tough job doubling up. Paternity leaves are thoughtful gifts not just for Dads, but for everyone in the family. Being a Mum of 3, it was a huge help with his presence at home. Singapore Dads are some of the most hands on parents I've ever seen. Extension of paternity leave is one great move. At least, I am one who truly appreciate it, which I believe many more do and will. I wished the 2 weeks paternity was gifted years ago, when we had no confinement help for the previous 2. It would have been a saviour! But the past shall not be raked. New Dads out there, do help around the house and the new baby with these added leaves. To all the Daddies' colleague who might turn on a green eye, get on the wagon of baby booming. It's no easy task, it's no vacation, but these are great Dads in the home and diligent workers at work. Happy Father's Day to our hero. Thank you for all the ongoing hardwork. We love and appreciate you! SHREK The Musical opened for the very First time in Singapore as part of its International tour! We were most glad to have caught this highly entertaining show mid this week. It was after watching this musical that I think they have brilliantly chosen a great film for live adaption. Great film adapted by professional crews and casts equates World Class production. 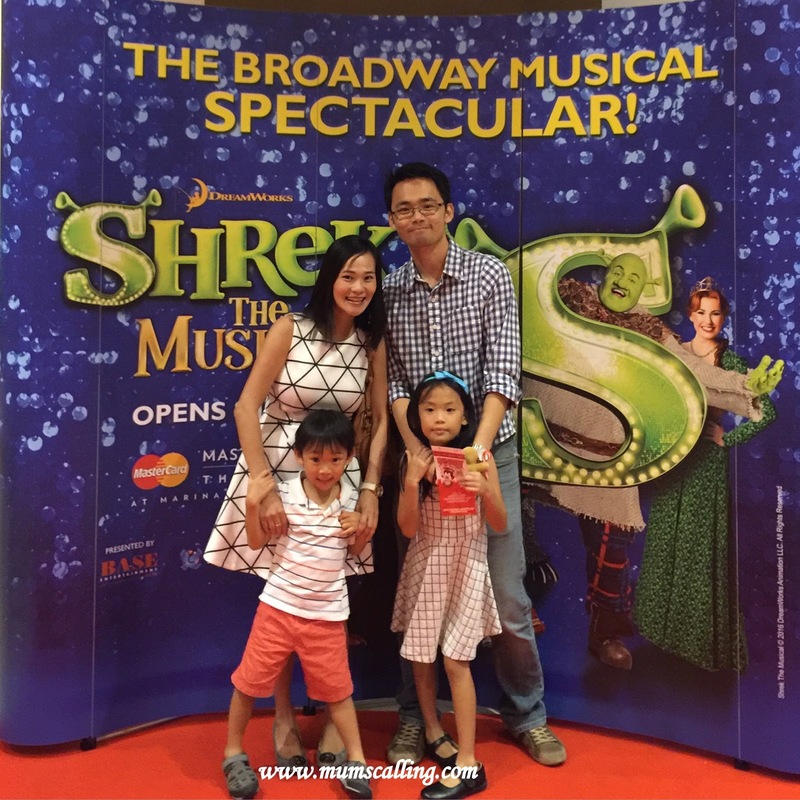 It's truly spectacular, or some say Shrektacular! When a green ogre named Shrek discovered his swamp had been 'swamped' with all sorts of fairytale creatures by the scheming Lord Farquaad, Shrek sets out with a very loud donkey by his side to 'persuade' Farquaad to give him his swamp back. Instead, a deal is made. 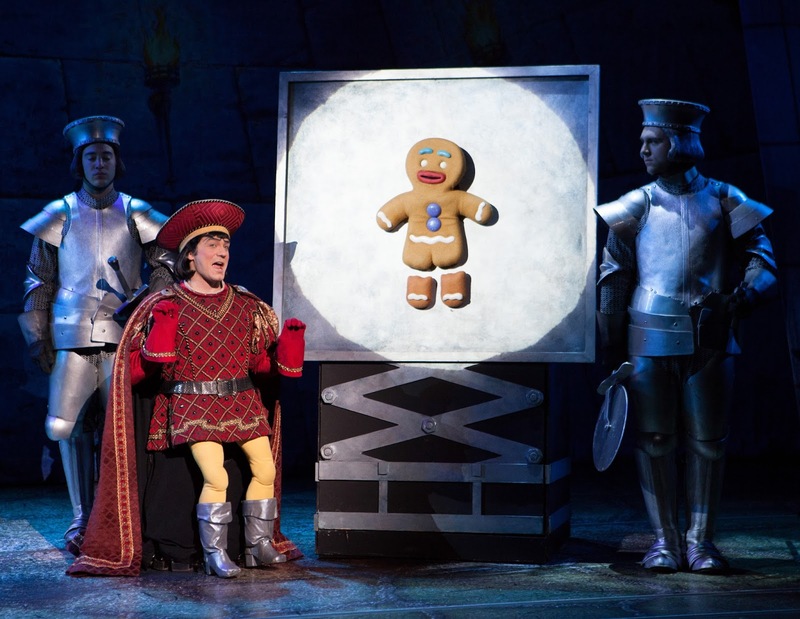 Lord Farquaad will give the fairy tale characters their homes back, if Shrek rescues Princess Fiona. Shrek obliges, yet finds something appealing about this pretty princess. He likes her! The casts were extremely professional. Every single one of them. A show would be flat if there wasn't a team of outstanding cast. It's Broadway we're talking about, anyway. Ogre buried under that layer of green was played by Kyle Timson (@kylertimson). His voice, accent, act and expressions were so much like that in the film. 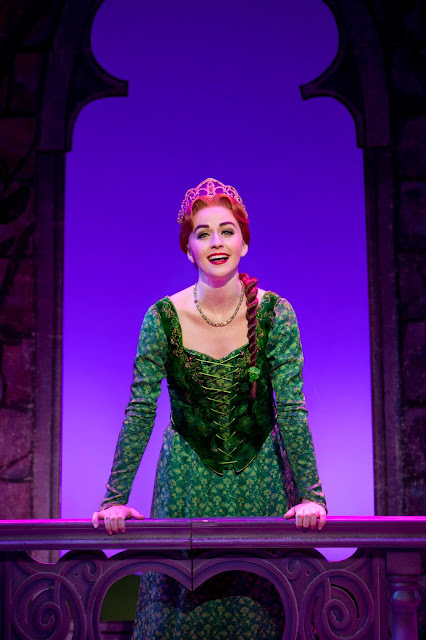 Princess Fiona played by Lindsay Estelle Dunn is another memorable role with its fiesty and sassy character. Gentle and dainty aren't in her dictionary, as she defines 'princess' in a whole new way. In this musical exclusive, you can catch the pair taking each other on a burping and farting challenge. Yes, you read me right. It was hysterically hilarious! And if you ask which was our favourite character, we would all agree it was the Donkey, played by Jared Howelton. Chatty, noisy and yakking non stop made him one extremely candid fellow on stage. And seriously, his animated voice sounded even more like that one in the film. 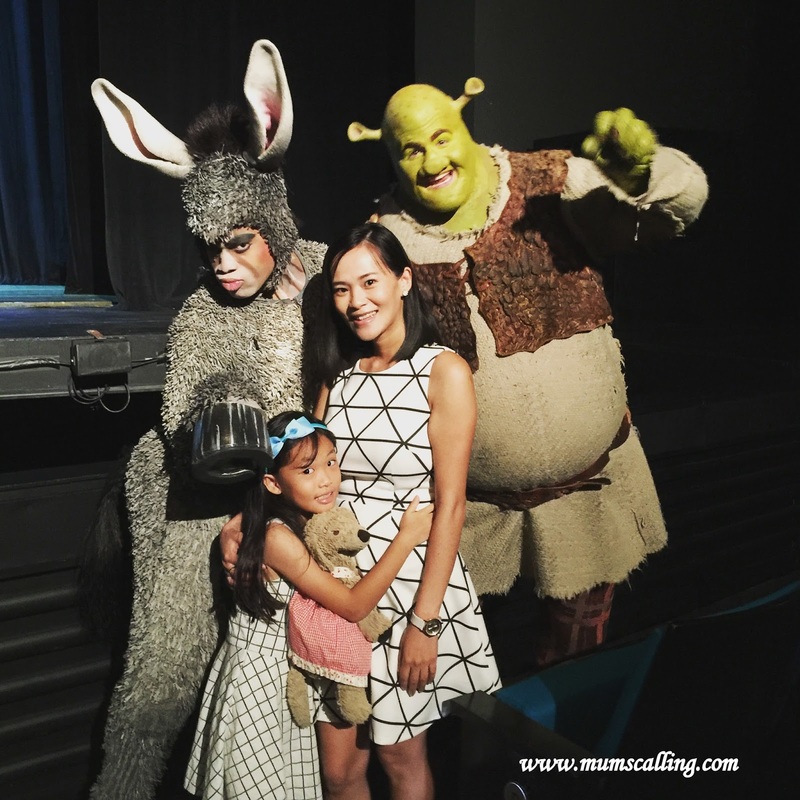 The rapport he has with Shrek on stage is way too engaging and funny. Current jokes included! Oh oh, and Lord Farquaad, played by Christian Marriner, was one cute guy too! Do evil and cute even go together? In the show perhaps. If you think he is permanently 4 feet tall, then you are wrong. He shrank from 6 feet, just for the show. Looking like a tough role in there. The songs sang in this musical aren't all the same as that in the movie. They were specially written for this musical with intelligent lyrics. 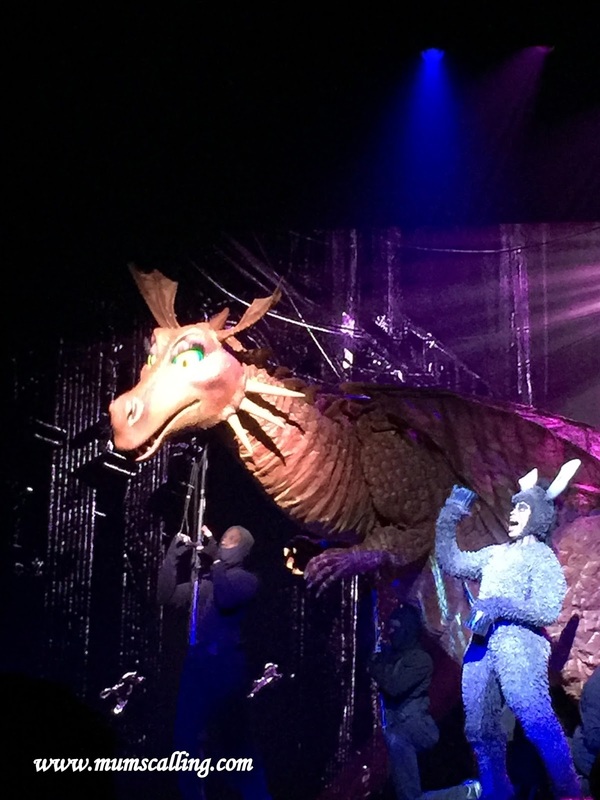 One song that impressed us the most was that sang by the dragon titled, Forever. Her powerful voice was astounding! I know dragon doesn't speak in the film, but in this adaption, she did! We love that extras were added in without taking anything away form the original. This has been beautifully adapted. We do know a little something about Shrek. If you ask where he would like to go in Singapore, he would say, the Botanic Gardens! Maybe that's the closest he can get to feeling like in a swamp. Oh, and one more, can you guess which fairy tale character he likes most? It's the Pinocchio! That's because he's just like him, accepting himself for who he is. That's one we should learn positively from Ogre. While Js caught SHREK 2 and 3, they didn't catch part 1. The adaption is based on part 1 story. So it doesn't matter if you've caught the film or not. That's because, you are likely to go on a SHREK movie marathon right after the musical. This is one we highly recommend not just for kids, but for any grown ups. It was a real delight and better than we thought. Not just for the story, casts and songs, but the stage set and lavish costumes were perfectly crafted too! Everything was of World class standard. It will be one lovely, funny and hilarious show that will crack up your week and send you feeling elated after watching. We enjoyed it very much and not one single moment did we feel bore by it. Nope, I did not have fidgety kids. Catch it before it closes on 19 June 2016! Get tickets here. Disclaimer: Tickets were given for the purpose of this review. All opinions and photos, unless credited are solely ours. Alive Museum is an Illusionary Entertainment Museum. Having been around for some time, we only visited it early this week. Through the use of optical illusions, 3D paintings on the surfaces of the museum walls, floors and ceilings came alive. The museum offers various themed galleries for visitors to take part and explore. The moment we entered, Js started to get creative with the paintings and displays. They couldn't keep the poses to themselves, they had to flaunt it! I've to say they were such natural actor and actress. I was very led by them when we were in. Forewarning, this post will be filled with pictures. At Alive Museum, pictures will always speak louder than words. It's all fun and easy! All you had need to do is blend in with the paintings and displays. Put on your best facial and body expression, then add on some skillful photography. You get great pictures just like this. Still no idea what to do? Fret not, instructions and posing examples will be up on the wall next to the featured painting you are taking. Look out too, for phototaking spot sticker on the floor. Those will guide the photographer on where to stand for the best photo effect. After which you may crop or rotate for the desired outcome. We visited the museum on a weekday, hence there wasn't any crowd to jostle photography with. You might need to move faster and get done with, if there's some crowd. This is probably the best time to visit the Alive Museum, before the current exhibits make way for new theme. Catch them while you can! Also, the tickets are now on a special 40% discount for a limited period. Adults at $15 and child tickets at $12. Book them online here. Children below 3 enter for free. Feel free to share or regram this post so that more people can know about this lovely venue. Giveaway ends on 18 June, 2359 hrs. The playeum has turnover to a new theme! It's now exhibiting Hideways - Creating with Nature. Offering an immersive environment for children to explore, observe, construct, reflect, innovate and engage with nature and natural materials through hands-on exhibits and interactive artists' installations. Basically, bringing the outdoor nature in. The exhibition follows the hugely successful inaugural exhibition 'The Art of Speed,' which Js had tremendous fun too. We love it for fun that's not the usual indoor playground, but experiential learning through Art and Play! Features animal sound pads and a range of textures and lights for infants and toddlers to explore the multi-sensory cave using their bodies, eyes and ears. It's a padded area where no shoes are allowed. Perfect for our little crawlers. Kinectic art work and hands on activities in this changing space. When we were there, kids were given the freedom to create 'spider web' using velcros and ropes. The ropes being white, were glowing beautifully under the UV light for play. It did work like a laser quest game for Js. What made it even more exciting in this room, was the sound of nature with insects 'conversing' and birds chirping. It was so fun that Js visited this room umpteen times. Knock, Knock! Who Live There? On special surveillance screens, children can view insects and other creatures, their natural habitats and record what they see, view real specimens and view the ants' nest in their natural environment. Goose bumps for me. This is also where children can work with magnifying glass to view enlarged insects, try to draw insects with some guide books available or even write a letter to the creepy crawlers! Yes, they do have a mailbox. Here's what our boy wrote to Mr Ant's family, "Dear ants, please come to our home." Oh well, we are definitely not gonna welcome pests as guests. Kids can imagine a world where they are as small as an insect in an immersive installation that presents the insect environment on a giant scale. They can construct shelters, which will grow throughout the exhibition's duration. It takes a little of a skill to tie these sticks together, while allowing that little imagination run. I got reminded of my outdoor camping days with these build and tie shelters. This installation invites kids to experience playing with clay and building imaginary habitats inspired by nature. These multiple miniature environments are then placed within a larger habitat, resulting in a collective make-believe hideway. Clay session is about 30 minutes and pre-registered if the place gets too crowded. Simply put your child's name on the board provided to indicate interest in the clay session. It's interesting on the type of habitat a child can press out of clay. After which, their works can go on display. Clay can be purchased at $5 if you would like to bring home. An interactive sound installation where children can create and build musical instruments with natural materials. These will be attached to a skelatal structure that will grow over the exhibition's duration. Be amazed at how sounds can be created from nature, like coconut husks. This is also where they can get crafty, building a natural habitat with the materials provided. Instructions are pasted on the wall on how to build an insect's habitat. Good for the clueless parents like me. Playeum is a well sought after venue for birthday parties hosting. While we were there, we caught sight of their birthday party activities held outdoor, and sneaked in for some play after they ended. Alright we weren't that sneaky after all. The friendly and kind staff offered us to play. Chalks were available to draw on the ground and colourful flower petals were given to 'colour' the drawing. Interesting! Js had great fun with nature. It isn't a place just for kids, but for parents to get their hands on together with their kids. No better deal than this. We spent about 2 hours playing, creating and experimenting before our tummies made the call to leave for dinner. Playeum is ideal for children between the ages 1 to 12. You may check them out for workshops and holiday programmes too. Feel free to share or regram this post so that more people can know of this lovely venue. Giveaway ends on 16 June, 2359 hrs.